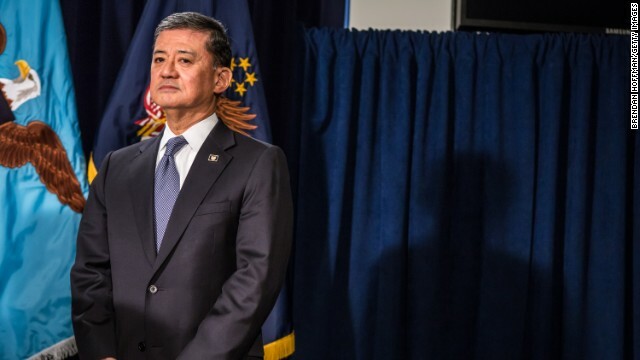 A veterans’ group says it has accumulated 29,000 signatures demanding that Veterans Affairs Secretary Eric Shinseki be fired over persistent delays in processing disability claims. Concerned Veterans of America sent a petition to President Barack Obama this week maintaining that Veterans Affairs disability claims have increased nearly 2,000 % since he took office in 2009. Shinseki has been the only veterans affairs secretary under Obama. In response, the Veterans Affairs Department acknowledged that “too many” veterans have to wait too long for benefits. “That’s unacceptable, and we are implementing a robust plan to fix the problem,” a statement said. Claims that have been pending for more than 125 days are said to be backlogged, according to the agency’s web site. There were more than 516,000 pending claims that fit the definition at the end of June, VA figures show. That was more than two thirds of all pending claims at the time. One reason for the backlog, according to the agency, is that more veterans are seeking claims, including those from the wars in Iraq and Afghanistan. Under Shinseki, the VA recognizes for the first time conditions related to Agent Orange exposure, Post Traumatic Stress Disorder, and Gulf War illness, which has led to a nearly a million new claims, it said. There is also the growing number of claims from World War II, Korea and Vietnam vets who hadn’t applied for medical help until recently. These reasons have not eased concerns of the veterans’ group. “Military commanders —given a mission and necessary resources—are not allowed to fail for four years and keep their job. Nor should Secretary Shinseki. His time is up. It’s time for new leadership,” its petition read. The VA said it is making progress in reducing the backlog, saying it has gone down by nearly 20 % in the past five months. Once it fully digitizes its system, the VA expects that figure to fall further. I have filed a claim in 1989, then reopen it 2003 because the condition got worse and appeal in 2004 here in the Winston- Salem area and now its 2014 and they still have made a decision in my case. This Va Sec and along with Congress and the Senate needs to be Fire and Tar,these people only look out for themselves.Goverment is self-serving this state I live in do nothing but impose taxes and take what little money I have like Dope Drug Dealers on the streets. 1. Outdated paper methods when it should all be electronic by this point. 3. The former general should stay right where he is at. Just like every other government funded system – Some people really need it and some people abuse it. My Comp & Pen evaluation was done by a General Medicine Physician's Assistant, he asked me questions from a VA TBI Questionnaire, then said thank you and told me he had all he needed. He dropped my rating for TBI from 40% to 0% and said that he didn't believe I had a TBI, but if I did, it must have been a very minor one. I was rated on the Glasgow Coma Scale with a 3, the lowest rating possible I spent two weeks in a coma. The Military and the VA states that loss of conscientiousness of more than 6 hours is rated as a SEVERE TBI, I was in a coma for 2 weeks. The PA looked at a years worth of medical records from 2011, and nothing else. I have been told the the VA raters have to go by the Comp & Pen Doctors write up. I have asked people how a General Medicine PA is allowed to do TBI evaluations, but there are no answers. I have asked how the GENERAL MEDICINE PA is allowed to not look at all of my VA medical records and give me a Comp & Pen Evaluation, and after a year I was told that I was coversheeted. The VA is so far behind, now they just complete Disability Evaluations to complete them, its about numbers, not the TRUTH. More than one year on a claim to reinstate my college age child as a dependent, and still waiting. Most you who are commenting are Vets, I presume. Me too. UNCLE has shown a disregard for servicemen historically and presently. Politics is the primary driving force for any government action. How many Vets are there in America? Lets hear their voices. ....TO KEEP FAITH WITH YOUR FELLOW SERVICEMAN. GOPs fight to go to war, DEMs fight to care for the soldiers coming home. All the politicians are jumping on the bandwagon claiming they will introduce laws and legislation that will end the backlog. All they are doing is trying to get elected or re-elected to there high-paying jobs paid for by us taxpayers. Nothing is getting done! The VA claims they have reduced the backlog by 20%. Of that group of claims, 90% have been DENIED! Of course the backlog is shrinking. They are denying veterans and closing the claims. The VA is singing their national anthem, "DENY, DENY, UNTIL THEY DIE!" 75%-80% of the veterans' claims backlogged are appeals from our heroes who keep being denied the compensation and medical care they deserve. Our HEROES are being DENIED MEDICAL CARE! It is time ALL AMERICANS STAND UP AND BE COUNTED. DEMAND THAT OUR DISABLED HEROES BE TAKEN CARE OF. THESE ARE THE MEN AND WOMEN WHO KEEP US FREE!! As a Vietnam vet, I can testify that our own country did not welcome us back home. We were considered unemployable. Even our "Christian churches" did nothing to support us. What do we expect for veterans of Iraq and Afghanistan? During the Vietnam debacle, military service was not voluntary. Either you enlist, or get drafted. Today, the situation is different. All military members are voluntary. Yet, the same stigmas apply. In the early 80's the VA routine was to conduct Agent Orange exams and automaticly deny any claim from a veteran who did not have boots on the ground, tens of thousands of Navy and Air Force veterans were wrongly denied. Agent orange soaked AirForce personel who were on the planes that sprayed it, many Navy veterans were sprayed from the over spray when the planes went over the harbors and turned around to do another spraying run. I observed two U.S. Coast Guard cutters behind my ship with dozens of 55 Gallon drums lined up at the edge of their ships, Coast Guard personel were punching holes in the drums with fire axes then pushing the drums over to sink to the bottom of Haiphong Harbor. Agent Orange spray doesn't stop at the beach, it is carried by the breezes and permeats everything around the area. The recent decision to include any veterans in the combat theater is a small step in the right direction, I urge any veteran who was previously denied to ask for another Agent Orange exam ASAP. I am a veteran Army nurse, and have a disability compensation claim pending in the VA system for nearly four year. The VA system in extremely complicated (an understatement), and I don't believe the blame for the VA's backlog can be place squarely on the shoulders of any one person. However, I am very saddened to see how our veterans in need of assistance and care must navigate and suffer through the massive bureaucracy known as the Veterans Administration. It just seems so unjust, and honestly, unbelievable. To all the veterans who may read this, thank you for your service– and hang in there with the system! Thank you for your service! Now disappear. We don't have any interest in helping you. Same thing happened after Vietnam, you are your own! When you call any vet a traitor, you have lost any respect you may have earned , name calling and attacking are earmarks of those who have no real idea or suggestions except to scream loud. I doubt the people who call others traitors have ever served, but will claim the moral high ground they have never earned themselves. All citizens have the right to agree or disagree without being attacked and screamed at, they call it FREEDOM, I know I and my family fought for it, not just for YOU!! But for all. "In response, the Veterans Affairs Department acknowledged that “too many” veterans have to wait too long for benefits. “That’s unacceptable, and we are implementing a robust plan to fix the problem,” a statement said." I can't tell you why or this post might get me in hot water, but I'm here to tell you that the entire VA, all of the way down to the Medical Centers, is working very, VERY hard every day (yes, weekends, too) and VERY long hours to erase the backlog of claims. I see it every day. The Honorable Secretary Shinseki has done more for Veterans than any one person ever has or may ever do. He's EXACTLY the right person for the job. I'm a disabled Vet with a claim in the works and I'm not bitter. A solution has been found and implemented, now let it work. We're seeing positive results. @Disabled Veteran,I posted a similar response saying there's a lot more vets needing help than in years ago..And I remember friends of mine waiting years to get medical claims approved because of Agent Orange and other war related medical maladies from Vietnam war not recognized by the VA..My question is where were all these cry babies years ago while Bushs and other presidents were residing,under a rock!! The VA hospital in Loma Linda California is so well run that it is scary. Usually seen a Dr. with in 10 minutes of my appointment time. It is not like that out on the street. This is the same general who was bitter about being shut out of the battlefield decisions in Iraq. Now we know why.......must be one of those perfume generals David Hackworth always talked about. They should allow VA physicians the ability to grant immediate temporary disability to those they deem will receive it eventually. Like those missing limbs, paralysis, blindness, etc.. Many times I've talked to VA docs who know the patient will receive disability eventually but the bureaucracy is horrendous. Our veterans have earned better treatment than this. As a 170% service connected disabled vet, I know the system that these heroes must navigate and the enormous stress it places upon them. As the rule was once and may still be that inpatient stays rated 100% disability payments for the duration anyway. This could be handled quickly by executive order!!! The American People want the American President, Senate, and Congress fired too, but that's not happening either! In my mind the delays border on criminal Let's start hold off paying government official for 3 years so they can understand the reality of the situation. I think it would be a bad idea to fire the Secretary. Under his leadership, eligibility for compensation disability has increased, hence a huge increase in claim activity. Perhaps the department should have better prepared for the projected increase as well. I think it's abominable that veterans have to wait so long for their decisions, but working from inside the system, I can see where there are areas that require vast improvement. I work my hardest to process the claims that come across my desk with absolute quality, but it is very overwhelming. So as a concerned citizen and VA employee, I hope that current plans to "fix" the system will start to show some progress SOON. @Concerned citizen,I understand the plight of todays vet as you are and yes its a huge undertaking for this man to work on! !Vets I know from the Vietnam era within the last 10 years have just started seeing improvements in care and their conditions from Agent Orange,other medical maladies being recognized ..Hang in there no matter what you do to make the public,vets happy they'll always be the ones in minority you'll never please!! The first secretary to actually do something about the backlog and they want to fire him. Brilliant, simply brilliant. My experience with the VA Houston facility has been very positive. My Disability Claim was approved in only 13 months, followed with an appeal for increase a year later that brought me up to a 90% rating. I understand the frustration of these Vets and hope the VA can resolve this backlog soon. One important piece that I left out of my earlier post is that it is important to understand that the VA has always had the ability to pay Veterans before an entire claim was completely processed. A decision maker would generate a partial rating decision to pay the Veteran and the VA would continue to use the same EP that was established with the old date of claim (It's called continuing the EP). I think Shinseki is in over his head. and you are going to be waiting longer since a lot of Senior Officers and Senior NCO are taking advantage and requesting to be Medical Board out of the army after they already have retirement order just to get faster with the VA C&P and get their rating much faster than anyone else....and I can proved it. The VA changed their rules so; they could do provisional ratings, new claims are tracked under new "end products", and once the provisional rating is put into the computer the "end product" is changed to a different "end product" so it is off the public and Congressional Radar. A tracking End Product or "EP" is a number that is used to identify different types of claims in the VA system. When it is created in the VA's computer system, the EP shows that date the claim was received by the VA. Disability and Pension claims usually have the following EPs: 110, 010, 020, 180, 120. There is sometimes a 3rd digit modifier on the EP for special identification such as PTSD claims. EPs were the easy way for everyone (Congress, Veterans, the Public, etc.) to see how many VA claims there are and how old those claims are. 400 End Product (EP): normally used to identify the processing of correspondence not disability or pension claims. The traditional process (simplified, but the important info is there): The Veteran files a disability claim and lists all the disability(ies) that he believes he incurred in service, or that he believes was aggravated by his military service. The claim is entered into the VA's computer system and an EP is attached to the Veteran's claim. The VA processes the Veteran claim until it can't get anymore evidence (private medical records, medical exams, statements, etc.) and all the time required limits expire. The claim then goes to the decision maker for a rating decision. The rating decision is entered into the VA computers and the EP was cleared from the system. The Veteran's claim is done. Now there were a lot of details that work to extend the life of the Veteran's claim. For example: If the veteran added a disability to an existing claim the VA would not get rid of the tracking EP until after the new disability had been processed as described above. Since a provisional decision is a temporary decision, the VA still has to track the claim because it's technically still an open claim (and by the old rules would still have the original date of claim). To track the still open claim, the VA establishes a 400 EP the computer system with the special indicator “OCR-Old Claim Review” and uses a new date of claim. Tada.....no more old claim..... But the old claim isn't finished, if the veteran doesn't ask the VA to finalize his claim, after ANOTHER year, the CA can generate the final decision and eliminate the newer 400 EP. Also,since the rules have changed, if a veteran files a claim today we establish one End Product (EP). If the veteran later wants to claim another disability, instead of lumping them altogether like before, the VA now establishes a new EP. Good references: For guidance on 2 year or older provisional claim decisions see VBA Letter 20-13-05. There is also a newer VBA Letter providing guidance on claims that are 1 year of older,but less than 2 years old but I don't have that number on hand. And that my friends is how the VA is able to fiddle with the numbers to get rid of (snicker, snicker, snort) 60,000 two year or older claims in a 2 months. If he is a Obama appointee, he is incompetent. Next item please. If he is incompetent, it has nothing to do with who appointed him. YOU sure aren't the brightest bulb in the package, if you believe that if Bush appointed him, then suddenly Presto! He is competent. @Taroya,you seem who forget that McCain a Bush bud shot down expanding Tricare for vets and he calls himself a vet,hero but you'd never know it ,more like the Saigon Songbird the traitor as he should be called! !Where were all these complaints when vets waited for years to see if they got approved for care for medical maladies related to war and some never getting it,from let's say Agent Orange ,PTSD ,any one want to chime in on that nasty little facts!! !